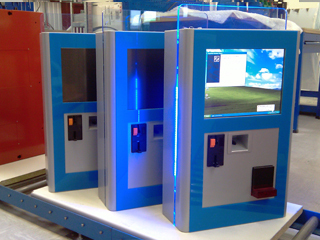 i-Touch V31 Slim-Line Metal and Glass Floor standing / Wall Mounted kiosk with 15'' screen - Future Generation Kiosk Products. As well as its wide application range, the most unique feature is the ability to simply fix the unit to a suitable wall, or use the base to convert this kiosk to a floor standing unit. The v31 Mark II also offers interchangeable option panels, which provide total flexibility in the configuration and functionality. This enables the same unit to be used in many different configurations to suit all types of environments, while maintaining synergy of product, especially where high traffic and durability is a requirement.